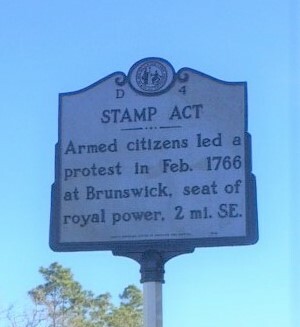 Armed citizens led a protest in Feb. 1766 at Brunswick, seat of royal power, 2 mi. SE. 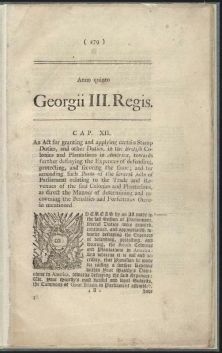 As England was having difficulty maintaining order in the colonies, Parliament turned to economic measures such as the Stamp Act of 1765. The law placed taxes on most forms of paper in the colonies, including newspapers, letters, pamphlets, and wills. While Parliament intended to defray costs incurred from stationing British troops in the colonies at critical sites such as Boston, the imposition of the tax drove many colonies to the brink of rebellion. On November 16, William Houston had traveled to Wilmington presumably on business. Hearing of his presence, a mob marched to the house where Houston was known to stay (as Houston lived in Duplin County), and demanded he renounce his duties as tax collector. He readily agreed, and with that, the crowd escorted Houston to the courthouse, where he officially resigned his position. A series of events unraveled in North Carolina that illustrated the colony’s stern resistance to the tax. 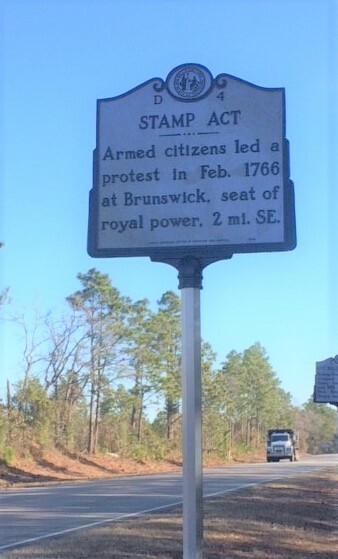 In February of 1766, Speaker John Ashe, D-65], Cornelius Harnett, James Moore, and Col. Hugh Waddell, led several hundred citizens through Brunswick, arresting key royal officials and forcing the comptroller to resign. Other similar acts of defiance in North Carolina and elsewhere took their toll on British resolve. Within a few months, the colonies learned that Parliament had repealed the Stamp Act.